One of the few female members of the postwar Italian modern movement, Gae Aulenti made a name for herself early in her career as an industrial designer, before gaining fame for larger architectural commissions. After studying architecture at the Politecnico di Milano, she worked as a furniture designer for various Italian department stores. 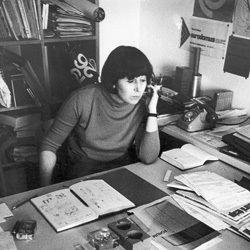 Aulenti first collaborated with Knoll on two showroom designs — Boston (1968) and 745 Fifth Avenue in New York (1970). In 1972, Knoll introduced the Jumbo Table, an imposing marble coffee table design she had originally conceived in 1965. Her second design for Knoll, introduced as the Aulenti Collection in 1976, was a complete collection including lounge seating, side chairs, and high and low tables. A member of ADI (Associazione per il Disegno Industriale) and the American Society of Interior Designers, Aulenti has designed furniture, lighting, textiles, showrooms, and stage sets for opera. She is responsible for the interiors of the Musée D'Orsay and the Contemporary Art Gallery and the Centre Pompidou, both in Paris. Most recently, she designed the Asian Art Museum of San Francisco.